Over the past three years, Plus 1 Communications has implemented the PR campaign for the no.1 culture festival in the Middle East. During this time, media interest has grown substantially, with the event attracting a variety of consumer, lifestyle and specialist media from across the region. Building the brand and excitement of the event has grown each year. 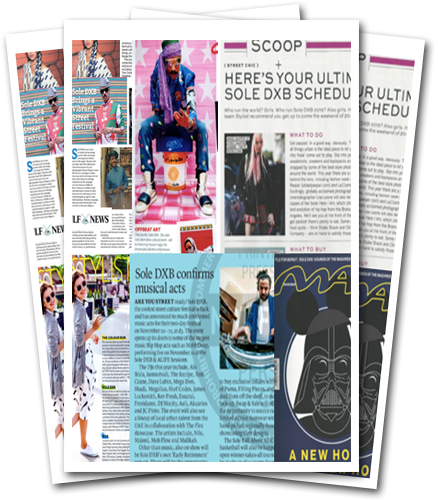 With ample content to play with and access to talent and brands, we have executed numerous interviews, features and exclusives with the media. In 2017, we generated over 350 articles reaching an online readership of 2.34 billion. It has become one of the most anticipated events in Dubai. Visitor figures have increased year on year and we are now planning for Sole DXB 2018.